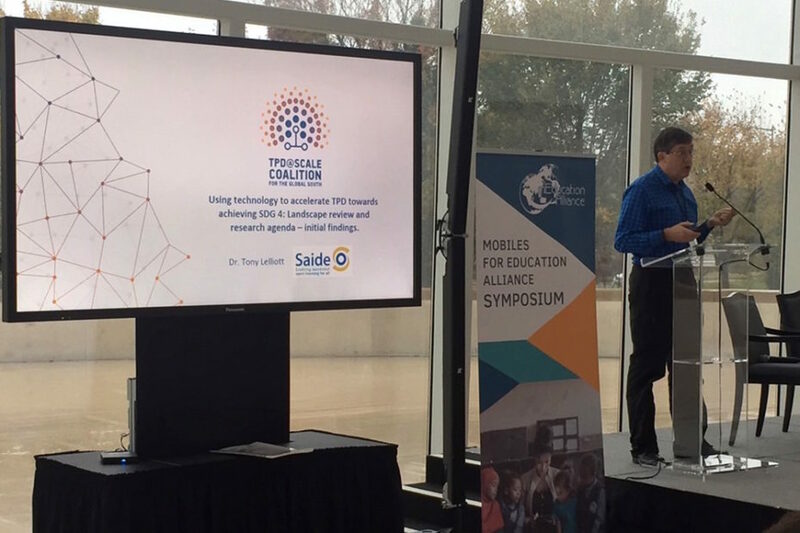 The Coalition led two special sessions at the 8th Annual Mobiles for Education Alliance Symposium, held at the United States Institute of Peace, Washington, D.C. from November 6 to 8, 2018, a yearly gathering of education technology innovators, practitioners, policymakers, and funders. The Coalition opened the Symposium with a special plenary session on TPD@Scale led by Tony Lelliott, Project Lead of the Coalition-commissioned landscape review and research agenda-setting on TPD@Scale, and moderated by Cher Ping Lim, Coalition Research and Development Manager. Dr. Lelliott presented preliminary findings from the landscape review, highlighting several issues identified through the analysis of cases: access to technology; the need for strategic partnerships and professional learning communities; the value of open education resources; the need for massive open online courses (MOOCs) to have appropriate pedagogies; recognition and incentivization; and the importance of blended methods of delivery. Dr. Lelliot also led the plenary audience in a brainstorming activity that yielded about 60 research questions for the research agenda and nearly 30 TPD projects for consideration in the landscape review.